Norah and I spent a Sunday with Paul on his family run farm which is located in Southern Ontario, Canada around Langton. We got to meet his wife, young son and two cats while we were there. 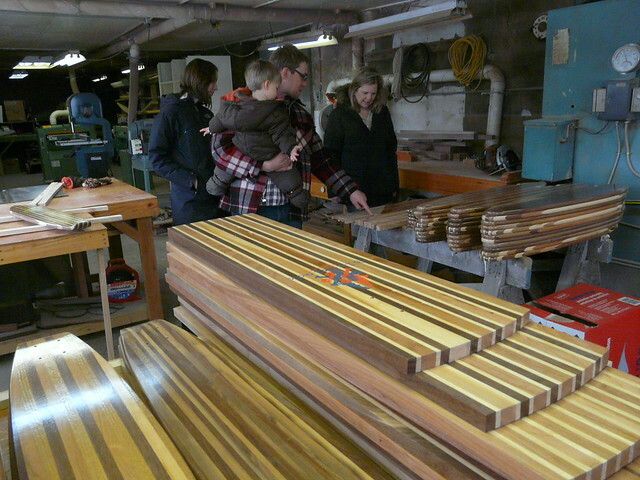 We were treated to lunch, a walk around his woodworking shop and a look at his large stockpile of domestic woods. Paul an accomplished tree farmer and woodworker operates a hundred and eighty acre farm in the once Tobacco belt of Ontario. 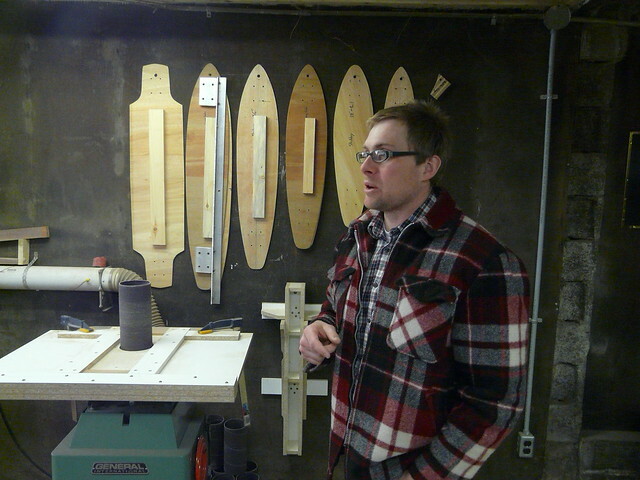 During the winter months after Christmas when the time consuming work of the tree farm slows down Paul making boards. Here are some photo’s and visit from our visit. 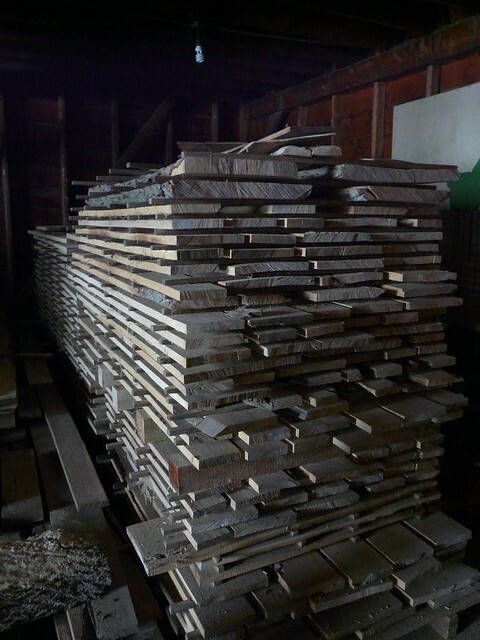 All of the wood Paul uses to make his vertical laminated boards are cut from trees fallen from somewhere on his property. 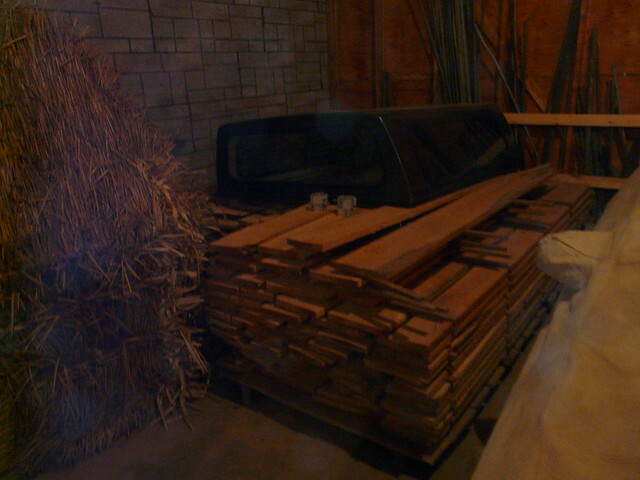 The trees are saw milled into planks of lumber and stored, carefully stacked into large stickered piles in a couple of barns. Seeing this much wood, cherry, walnut, maple and oak and knowing it is destined to be turned into a board was a humbling experience for me. The complete stages, right there from tree to finished board. It cannot get better for anyone passionate about making boards. 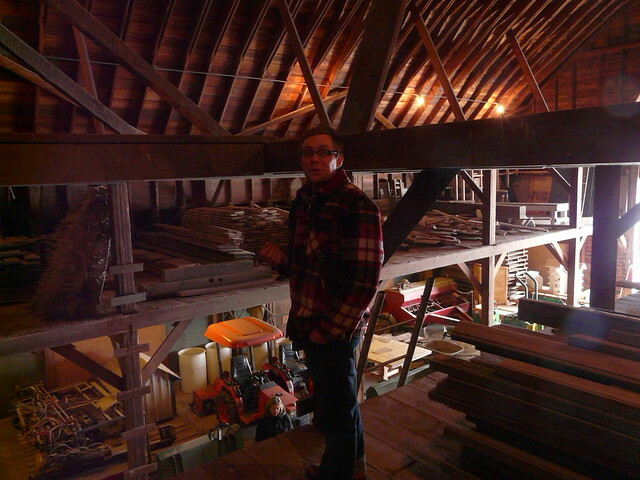 Paul showing off his stored wood in the rafters of his barn. One of many stickered, stacks of wood. To properly dry wood the cut planks have to be stored in a cool, dry environment for a year or more where air can circulate around each plank. You can see in the photo that each layer of wood is separated by sticks that run across each layer. Here you can see paul’s templates use to create each deck shape. Paul’s shop is equipped with great tools. A reciprocating drum sander and a sweet jig setup is shown below, a time saver for precise shaping boards and cutting wheel wells. My favorite was this walnut board with criss cross lines of inlaid maple. 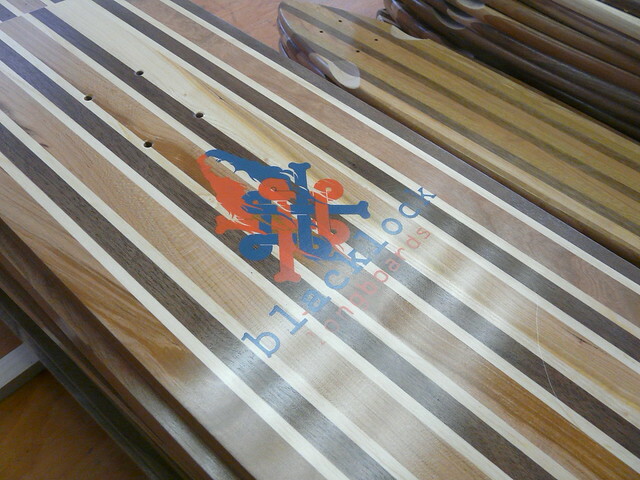 What a great looking Longboard! 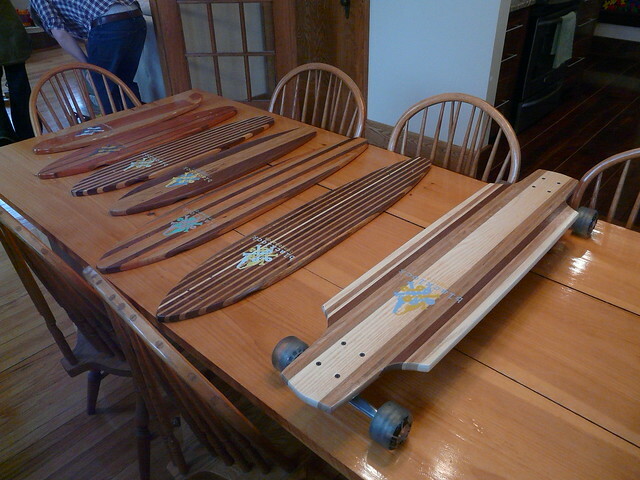 A lucky kid to have a dad that builds boards for him! 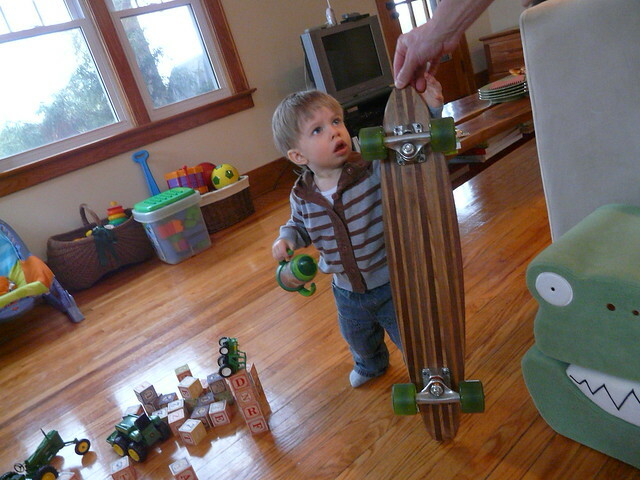 Did you know that Sugar Maple, grown in northern Canada is the best skateboard building material available? 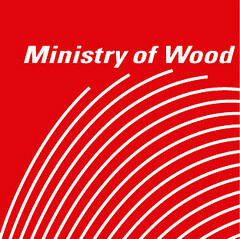 It is 10% stronger than maple grown in the North Eastern States. It is all because of our longer, colder Canadian winters. If it's snowing in your part of the country and you can't longboard ..... BUILD THEM! Try out a cabinet scraper for taking glue and paint off of a deck. Be prepared! When laminating any skateboard remember to have all your tools at hand. All glues have a wet time. Some are longer than others. Titebond III has one of the longest wet times, 9 minutes as opposed to 4 or 5 for regular water based woodworking glues. That extra 4 minutes makes a big difference when gluing up a deck. 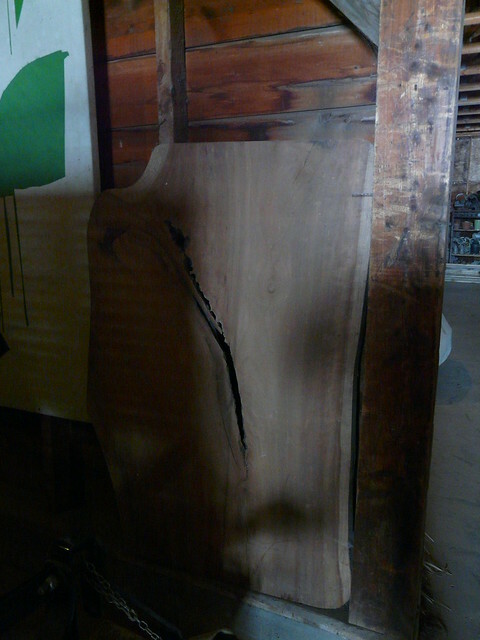 For dancers that are longer than 48" you can offset 1/16" maple veneers as you laminate your deck. Butting them end to end works great. Make sure the offset of veneers is at least 16" apart. Use a vacuum cleaner to evacuate most of the air from a TAP bag before using the manual pump. Always use the same paint brand when painting your deck. Different paint brands are sometimes incompatible with one another. After purchasing veneers by mail, let your veneers acclimatize to the moisture content of your shop for a couple of days before laminating them into a deck. Keep unfinished decks out of anywhere there is a lot of heat. The outer layers are prone to cracking. Apply a sealer coat ASAP after sanding your deck. After using your glue filled roller. Do not wash it out. Place it in a ziplok bag. It will last for weeks and be charged with glue for your next build. 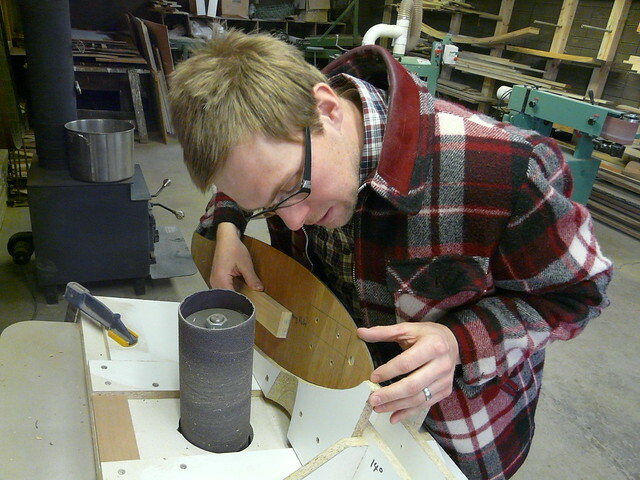 Water based glue makes maple veneer more flexible. Applying water to tight bends on the top and bottom of the outer two layers will make it easier to achieve tighter bends. Apply clear packing tape onto your foam mold to protect it from glue while pressing.